Many Native American cultures accept that the eagle carries prayers to the creator. 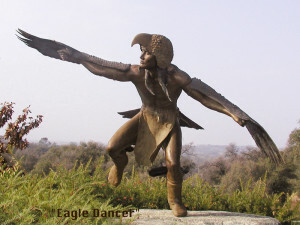 The Hopi of Northeastern Arizona consider the eagle as the connecting link between heaven and earth, and the eagle plumes as the prayer bearers. The Eagle Dance is done by a warrior in full eagle wing regalia who depicts the grace and beauty of the majestic eagle in flight. The Tesuque Pueblo are thought to be some of the best. Soon available in maquette size.